The Swiss Church in London in cooperation with Goldsmiths University cordially invites you to the upcoming solo show of London-based, Irish artist Patrick Hough. 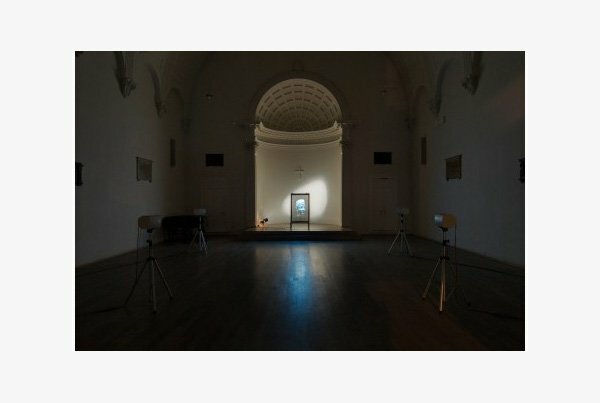 Curated by Goldsmiths student Marian Stindt, the exhibition Hierophanies takes as its departure the 500th anniversary of the Reformation. During the process of Reformation, objects belonging to the church were stripped of their holy status, inducing a wave of iconoclasm, or the destruction of religious imagery. Patrick Hough’s work reflects on the relationship between archaeology, technology and the reanimating power of digital cinema, in the context of contemporary iconoclasm – particularly the recent destruction of cultural and religious heritage throughout Syria and Iraq. Exhibition continues until 17 March.